It's not uncommon to see squirrels with sores or missing hair around the neck. According to University of Florida, the sores mostly result from swelling and typically form between July and October. Nonetheless, just like many other animals, visible sores on squirrel necks may also result from other concerns, such as infections or physical injuries from fights. For territorial reasons, squirrels sometimes attack each other. One may intrude the residence of another. They also battle for food. Fights may result in serious injuries caused mostly by biting. The mouth is the squirrel's main fighting weapon. 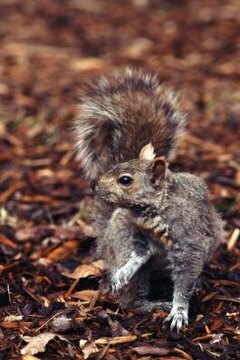 Squirrels that engage in fights may suffer neck and head injuries that can develop sores. Also, swelling attained during fights may become sores, abscesses or tumors in the future. The botfly is an obligate squirrel parasite whose presence is evidenced by fluid-draining warbles on the neck skin of a squirrel. The swellings usually appears between July and October due to the subcutaneous larvae of botfly in the host squirrel, the University of Florida extension website says. Female botflies lay their eggs on vegetation around the squirrel habitat. The larvae may enter a squirrel through the mouth or nose, and settle under the skin. The larval waste products eventually cause swelling and sores. Mange -- a skin inflammatory infection -- is caused by mites (Notoedres douglasi) and leads to hair loss and skin swelling. Severe swelling leaves a squirrel hairless and full of sores around the neck. The infection can spread to other squirrels through physical contact. A squirrel may recover from the mange infection after some time, after which the neck grows hair normally. Mange infections occur seasonally during the larval stages of the mites. This is because the larvae stay in the squirrel body until pupal stage, when they make their way out. Their exit is what leaves behind sores on the squirrel skin. Through close interaction, squirrels may get respiratory tract infections from other animals suffering from viral diseases. The common cold virus, which affects the upper respiratory tract's trachea, larynx and pharynx, causes severe symptoms in squirrels. The neck area is highly affected and the squirrel experiences sore throat, running nose and fever. The virus spreads throughout the respiratory tract, and the condition may become serious. As result, the squirrel develops swelling around the neck which eventually burst to sores. How Do Squirrel Droppings Compare to Rat Droppings?